"When n*ggers are scared, that's when white folks are safe." Filmed and projected in glorious, extra-wide Ultra Panavision 70mm film, Quentin Tarantino's appropriately named eighth feature is an ensemble western full of his trademark brand of unsavoury characters speaking his heightened dialogue. 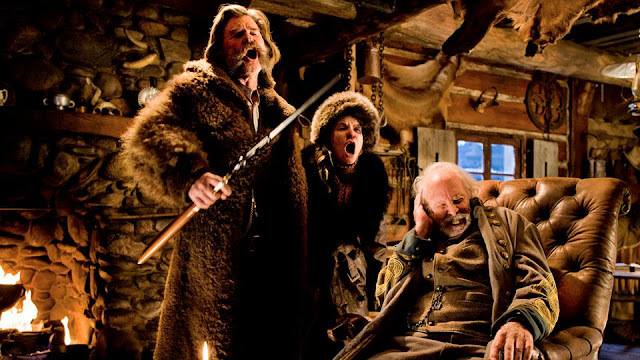 The Hateful Eight is a post-Civil War rumination on the Old West and essentially a three-hour long Mexican standoff set almost entirely in the single location of the snowbound Minnie's Haberdashery during a Wyoming blizzard. The so-called eight characters are a diverse bunch of degenerates. Tarantino uses these seven men and one woman to riff on America's history of violence. A western in the mould of his first film, Reservoir Dogs, mixed with a John Carpenter's The Thing style premise and a sort of spiritual follow-up to his slavery era set Django Unchained, The Hateful Eight uses the blood-soaked spaghetti western and its film tropes to draw out tension in B-movie fashion of Tarantino's most explicitly political film. A very spry Samuel L. Jackson as Major Marquis Warren embodies the role of a former Union soldier turned bounty hunter with every ounce of his talent spewing Tarantino's pulpy dialogue with great style and reverence. Kurt Russell goes big and broad as "The Hangman" with a big mouth transporting the wanted Jennifer Jason Leigh, a despicable fugitive named Daisy. Among the talented cast, Walton Goggins easily stands out as a renegade looking for safe passage whose character slowly builds to a magnificent and hilarious crescendo starting out as a punchline and evolving to into the lawman he claims to be. Mexican actor Demián Bichir, the former Mr. Orange and Mr. Blonde (Tim Roth and Michael Madsen), and a feisty Bruce Dern round out the loathsome octet in fine form. The two Reservoir Dogs feel rather underused and act more to round out the eclectic cast than assert their own shadowy motives. Tarantino carefully sprinkles every character with a certain amount of irredeemability as each slowly reveals their own secrets to play against our expectations. Split into five engrossing and unique chapters, the thrills and laughs build before kind of falling apart in the last act in trademark Tarantino fashion as he writes his characters into various corners where style and flair emerge to replace any sense of an identifiable reality. Cinematographer Robert Richardson's camera frames the tension and violence with an uncomfortable beauty amidst its snowcapped locale. Famed composer Ennio Morricone graces Tarantino's film with his first ever proper musical score adding an air of cinematic western authenticity in between contemporary cultural references. It's a grand, propulsive sound that underscores the threat of violence throughout. Morricone gives this Tarantino work of pulp fiction a dynamic quality ratcheting up the uncertainty as it moves along. For his eighth feature, Tarantino ruminates on all seven previous entries of his filmography in the vein of Fellini's 8½. It's a beautiful but difficult and messy powder keg of a film that starts to madden and frustrate in its final act just as it delights and entertains in every cinematic way possible simmering with tension before its all out violence bursts onto screen. The Hateful Eight is an intimately told and claustrophobic yet still impossibly lyrical film about the violent history of men. The Hateful Eight roadshow presentation in 70mm film screens exclusively at The Park Theatre (only one of four theatres in Canada and a hundred in North America) for a limited run engagement starting on Christmas Day and features an overture and short intermission.